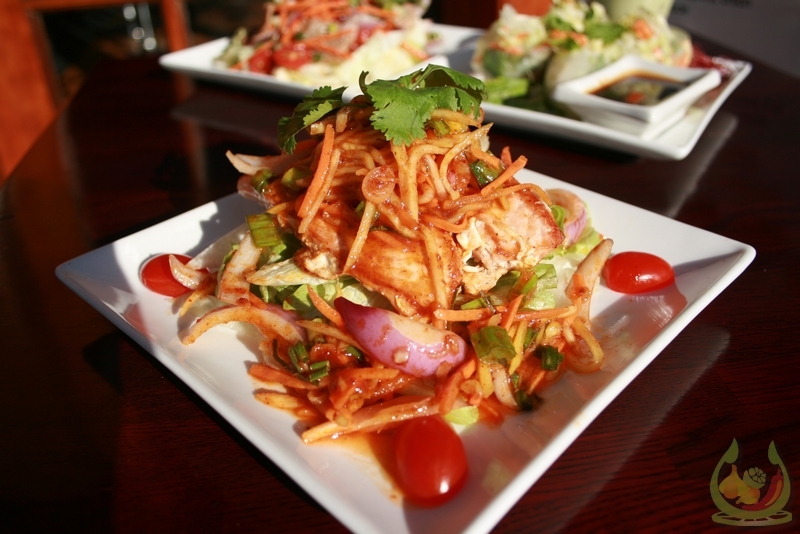 Marinated in Thai seasonings and grilled -served with Thai style peanut sauce. Fresh tofu deep fried to golden brown -served with sweet chili sauce and ground peanuts. Mix ground chicken, curry powder, potatoes, onions, carrots wrapped with pastry and deep friend - served with fresh sweet cucumber sauce. A delicate combination of fresh vegetables and bean thread noodles in spring roll pastry deep fried - served with Thai style plum sauce. Thai style garlic sauce and prawns rolled in pastry deep fried - served with sweet chili sauce. Lightly breaded and deep fried - served with sweet chili sauce. Refreshing addition to any meal, cucumbers sliced thin, cabbage, onions and carrots in rice vinaigrette. Steam or friend - served with sweet chili sauce. Crispy fried soft shell crab served with sweet chili sauce. Grilled special trim beef tossed with Thai basil, cilantro, lime leaves, lemon grass, red onions and Thai style lime juice on a bed of mix green salad. A rich aromatic clear broth soup with lemon grass, kaffir lime leaves, tomato, onion and mushroom garnished with spring onion. Tradition Thai favorite soup with coconut milk, kaffir lime leaves, lemon grass, galangal root and mushroom garnished with spring onion. Red curry paste with coconut milk, bamboo shoots, bell peppers, and fresh Thai basil. Green curry paste with coconut milk, bell peppers, zucchini, bamboo shoots and fresh Thai basil. Panang curry paste with coconut milk, basil leaves, bell peppers and kaffir lime leaves. Red curry paste with coconut milk, pineapple, bell peppers, basil leaves and kaffir lime leaves. Stir-fried bell peppers, onions, zucchini, baby corn, carrots, celery, mushroom, cashew nut and home made cashew sauce. Stir-fried fresh garlic with Thai special sauce bed of steamed vegetables and smother with seared garlic. Stir-fried fresh Thai basil, bell pepper, onions, mushroom and home made sauce. Stir-fried bell pepper, pineapple, tomato, cucumber, sweet pea, onion , celery, baby corn, mushroom, carrot and home made Thai sweet and sour sauce. Lightly breaded and deep fried, sauteed with fresh orange, onions, broccoli, carrot, mushroom and a delicious Thai home made orange sauce. Stir-fried spinach and bean sprouts with Thai best peanut sauce. Stir-fried fresh ginger, bell peppers, onions, mushrooms, celery, baby corn, carrots in black bean sauce. Stir-fried bell peppers, onions, and Thai basil with homemade Thai lemon grass sauce. Stir-fried and smothered with Thai original tamarind sauce, bell peppers, onions, cashews, water chestnuts, and snow peas. Choice of tender chicken, pork, beef topped with sensational home made teriyaki sauce Thai style. All fresh vegetables sauteed with garlic sauce and curry powder. Stir-fried with jasmine rice, egg, carrots, tomato, onions, green peas and garnished with cilantro and spring onion. Stir-fried with jasmine rice, egg, pineapples, onions, tomato, green peas, carrots, curry powder, and raisins. Popular Thai noodle dish made with stir-fried rice noodles, egg, bean sprouts, scallions and ground peanuts on the top. Stir-fried rice noodles, broccoli, egg and fresh mushroom in garlic black bean sauce. Stir-fried rice noodles, egg, onions, fresh mushroom and fresh Thai basil.